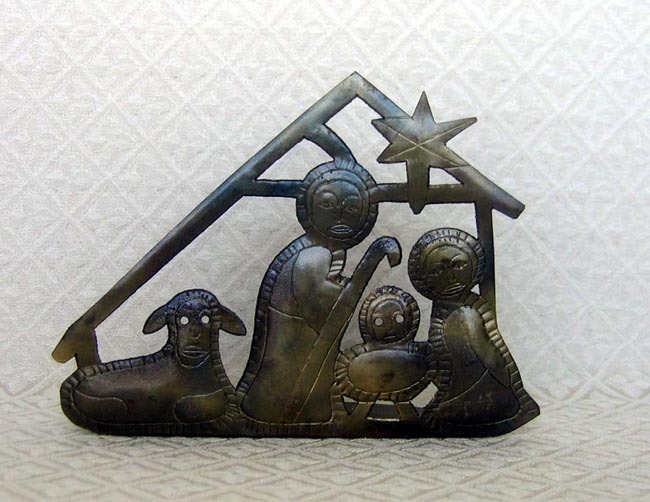 This Nativity plaque is handmade by artisans in India from simple iron. The scene depicts the Holy Family and a sheep in a stable. A small candle could be placed behind the scene to accentuate the baby Jesus in his manger, if desired. The plaque is 4.75 inches tall. A card included with the plaque states that the iron is not treated and is left in its natural state, so the piece will slowly rust unless sealed with lacquer. The imperfections are part of the uniqueness of this piece.